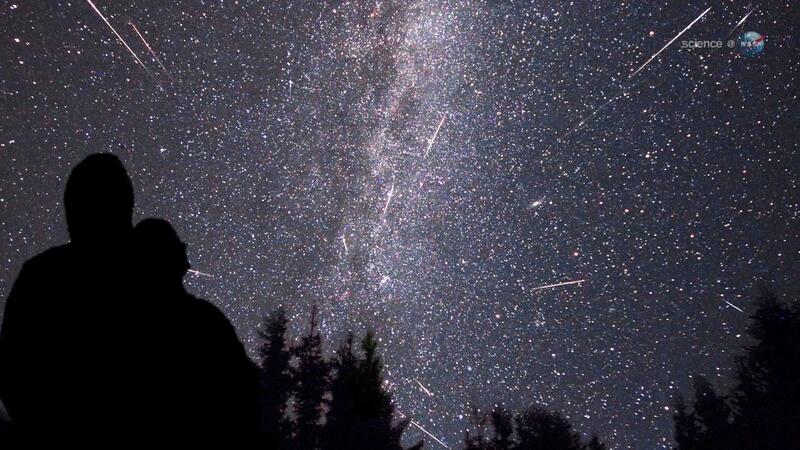 If April showers bring May flowers, what do meteor showers bring? Well-known annual meteor showers include the Perseids in August, the Geminids in December, and, this month, the Lyrids. Names are assigned to the showers depending on where the meteors appear to originate in the sky. The predictable nature of these events is due to the fact that meteor showers occur when the Earth’s orbital path intersects with a comet’s orbital path. When a comet is close to the Sun, the heat causes its ice to vaporize, creating geysers that propel pieces of ice and rock into its path. These pieces may become future meteors. Meteor showers have been documented for over 2,000 years, long before stargazers had any notion of what was responsible for such phenomena. Certain years, the showers happened to coincide with significant events, such as the rise of a new king or the death of a religious martyr. Yet meteor showers are more than celestial omens or beautiful spectacles. Some scientists credit ancient meteors with bringing the first organic matter from the deep reaches of space to planet Earth. If meteors reach the Earth’s surface, they are termed “meteorites,” and it is these rocks that some suggest carried amino acids, the building blocks of proteins. You’ve been listening to Western Slope Skies, produced by members of the Black Canyon Astronomical Society. This episode was written by Gina Poulson and recorded by Nick Myers. Both are Park Rangers at Black Canyon of the Gunnison National Park.